…It’s a pdf of a paper I wrote my senior year of high school for AP Composition titled “Creationists in Scientists’ Clothing: Scientific and Legal Reasons Why Science Classes Must Omit Intelligent Design.” It’s pretty damn good considering I was 18 when I wrote it, but I derive endless amusement at how serious it’s being treated. 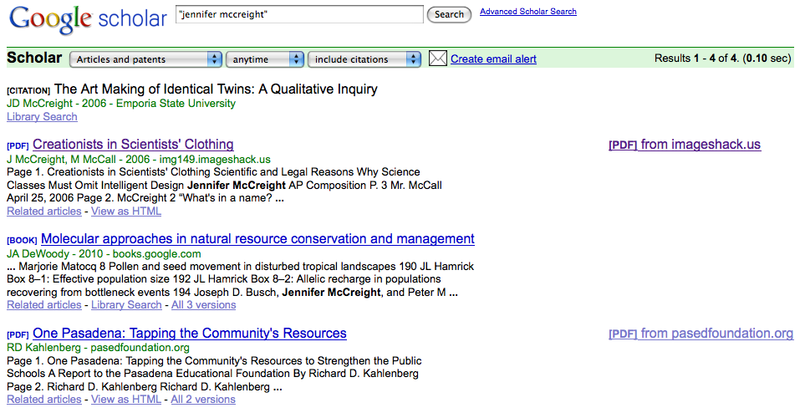 Apparently my English teacher is second author, and the journal is ImageShack. 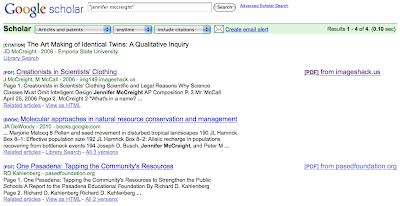 I mean, come on Google Scholar, how unprofessional. You forgot to mention it was 3rd period! What will happen to my academic reputation if someone thinks I was in 2nd period?! Excellent submit! We will be linking to this excellent put up on our site. Preserve up the good creating. When I at first commented I clicked the “Notify me when new comments are added” checkbox and now each and every time a comment is extra I get 3 email messages with the exact same comment. Is there any way you can remove me from that support? Thank you! Do you have a spam difficulty on this blog I also am a blogger, and I was seeking to know your situation we have created some nice processes and we are hunting to swap techniques with other individuals, be sure to shoot me an e-mail if intrigued. What is up it’s me, I am also going to this internet site on a typical foundation, this website is actually enjoyable and the viewers are in fact sharing great ideas. Good way of outlining, and fastidious report to get details regarding my presentation subject matter issue, which i am likely to express in faculty.